One more win for the title! 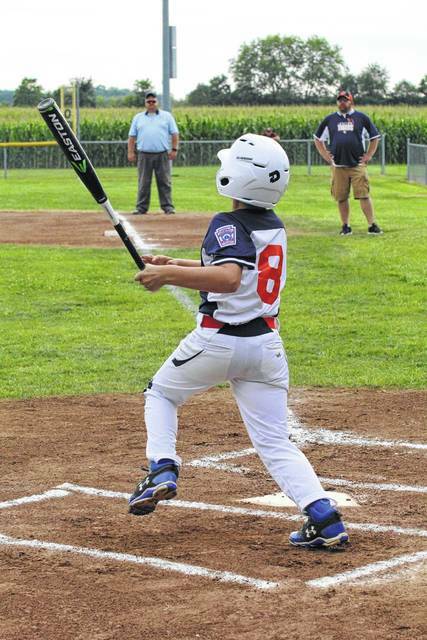 GALION — Galion 10U Little League all-star team memer Jimmy Hardy watches the ball fly off htis bat during Wednesday’s 6-2 win over New Albany in the 10U Little League state tournament in Englewood. The locals play Saturday in the state championship game at 11 a.m. in Centennial Park in Englewood. If Galion loses at 11 a.m., the two teams will play at 1:30 p.m. for the title. Erin Miller | Galion Inquirer Jimmy Hardy watches the ball fly off his bat during Wednesday’s 6-2 win over New Albany in the 10U Little League state tournament in Englewood. The locals play today in the state championship game at 11 a.m. in Centennial Park. If Galion loses at 11 a.m., the two teams will play at 1:30 p.m. for the title. https://www.galioninquirer.com/wp-content/uploads/sites/38/2017/07/web1_IMG_6282.jpgErin Miller | Galion Inquirer Jimmy Hardy watches the ball fly off his bat during Wednesday’s 6-2 win over New Albany in the 10U Little League state tournament in Englewood. The locals play today in the state championship game at 11 a.m. in Centennial Park. If Galion loses at 11 a.m., the two teams will play at 1:30 p.m. for the title.